An engaging app for students? Possibly. But it’s a tough sell. 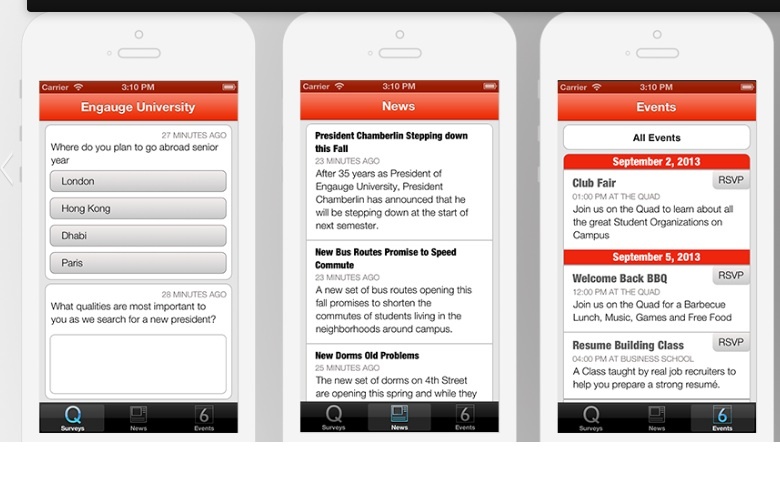 The Chronicle of Higher Education has a story on a new app which claims to offer faster outreach to students. But will it catch on? The app, Student Engauge, is part of a larger trend toward mobile outreach, as colleges seek ways to engage with students who often don’t respond to e-mails or online pestering, says Justin Reich, a fellow at Harvard University’s Berkman Center for Internet and Society. The app follows in the path of mobile warning messages that many colleges have adopted to alert students of campus emergencies. Once downloaded on a mobile device, Student Engauge syncs to a student directory, allowing students to authorize their accounts using their existing credentials. The college can then send out questions or alerts based on those data—for example, asking a student whether he or she liked a professor, or asking a specific group of students if they found a counseling session to be helpful. More details can be found on the website. Does it offer enough to ensure widespread adoption? It’s not at all clear. And it could really do with a better name. This entry was posted in Admin, Communications, HE, Students, University and tagged Administration, app, Chronicle, Students, universities by Paul. Bookmark the permalink. If they added an element of gamification, pitching students against each other to be the most engaged with their uni (a bit like FourSquare does) and unlocking certain rewards (on campus discounts/freebies or linked somehow to a participation credit on their course) I could see it being useful. This would involve a fair bit of customisation, however, so may not fit their business model.